This time of year, one visits Mt. Loretto Unique Area, a NYS DEC property on Staten Island, for the rich plethora of summer plants and insects, with some good birds thrown into the mix. But as soon as we got out of the car the other day, we noticed two big dark birds in the distance behind the church on the other side of Hylan Blvd. Vultures, right? (This made me think that I have not seen a lot of vultures this summer.) But but but… no. Not vultures: too brown, flapping too much, not holding their wings in that vulturine dihedral… wait a sec! Yes, eagles. A mature third bird, with white head and tail, definitely put the frosting on that cake. 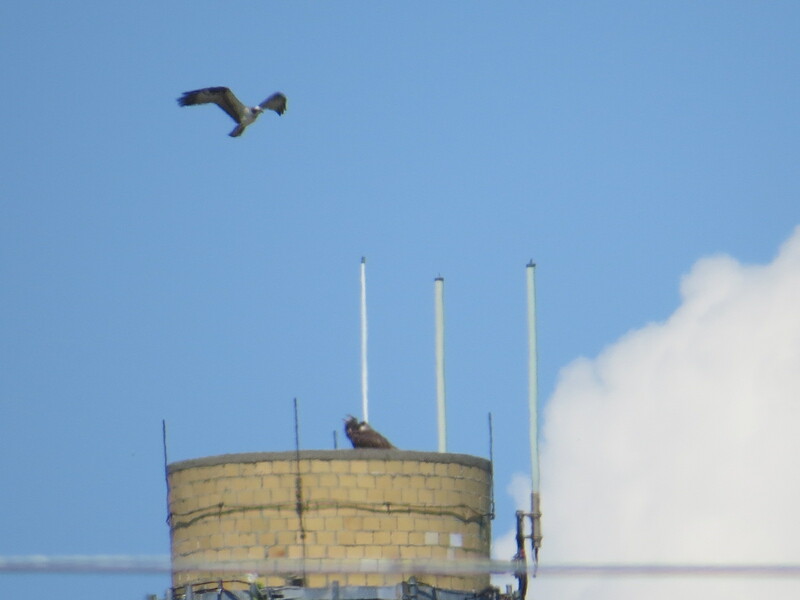 All three were briefly perched on the old brick chimney near the church. 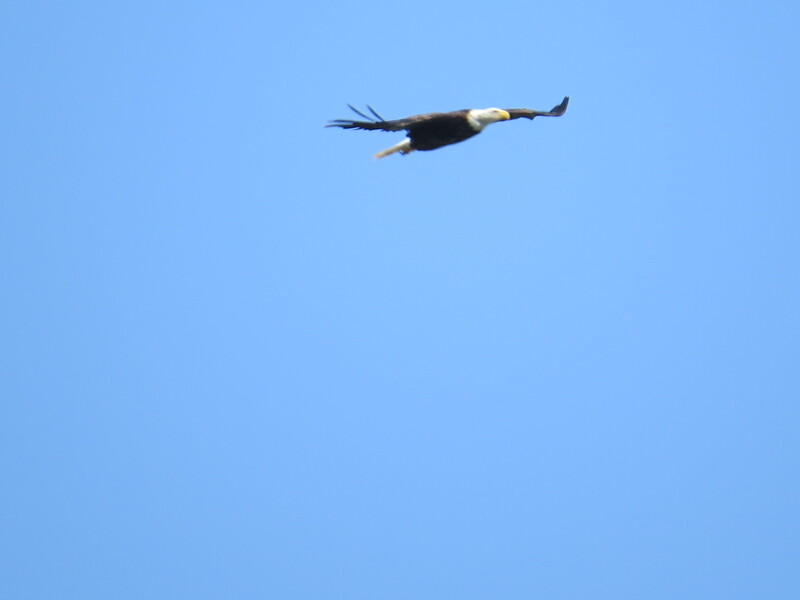 An Osprey mixed it up with them. 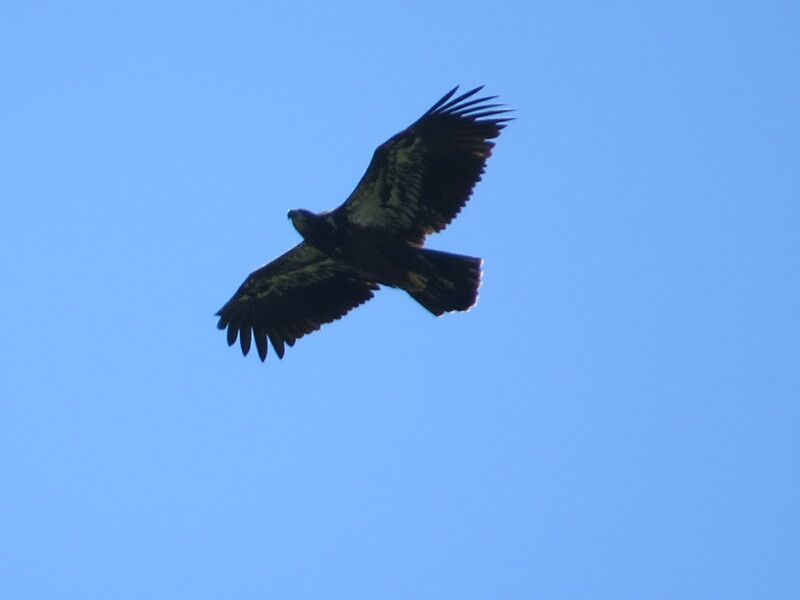 Here it’s buzzing one of the young eagles. Primarily fish-eaters and scavengers, Bald Eagles are not averse to taking young Osprey right out of the nest. You may recall that last year there was breaking news that Staten Island was hosting a Bald Eagle nest. That may have been somewhat premature; it seems as if the birds were just practicing nest-building. The two dark birds now are subadult, but I’m not practiced enough to tell how old they are. It takes five years or so to get that full white head and tail. I don’t know if we’re looking at a nest that produced two youngsters this year, but it sure looks like it. Let me know if you know more details. Later in the afternoon, while we were watching young Common Terns begging for food on the beach, we saw the trio of eagles again. Some terns went after them, one on one, so much smaller than the eagles. We were close enough to see one of young eagles wheel to its side and flare its great claws, which are as big as human hands, at the fearless terns. UPDATE 8/10: I’ve gotten some confirmation that these are two yearlings. Congratulations, Staten Island! It is wonderful to see bald eagles and osprey recovering in urban areas like this and (hopefully) nesting…simply amazing!